For the chicken, put the flour on a large plate. Mix in the smoked paprika, mustard powder and ½ teaspoon salt. Put the eggs in a shallow bowl and mix the breadcrumbs and sesame seeds together in another shallow bowl. Coat each chicken breast with the flour mixture and pat off any excess. Dip in the egg and then the breadcrumb mixture. Set aside. Pour the oil into a large frying pan until 2cm/¾in deep. Heat to a medium temperature. (CAUTION: hot oil can be dangerous. Do not leave unattended.) This is important – too hot and the outside will burn before the chicken is cooked, too cool and the coating will just absorb the oil. To test, add a cube of bread to the hot oil, it should be crisp and golden-brown after 2-3 minutes. Fry the chicken for 3-4 minutes on each side, or until deep golden-brown. You may have to do this in batches – if so, keep the cooked chicken warm in a low oven and make sure the oil returns to a medium heat before you cook the second batch. For the garlic mayonnaise, mash the garlic to a paste with a little salt. Put in a bowl with the egg yolks and mustard and mix well. Start drizzling in the oil, a few drops at a time, whisking constantly, until you have an emulsion. Keep adding the oil, very gradually, until you have incorporated it all. If the mayonnaise is becoming greasy or too thick to work with, add a few drops of warm water and whisk thoroughly before adding any more oil. Taste, and add more seasoning and a squeeze of lemon or vinegar if it needs acidity. For the coleslaw, put the red cabbage, carrot and onion in a bowl. Toss the apple in the lemon juice to stop it from browning, and add this to the cabbage. Sprinkle in the caraway seeds and mix thoroughly. Whisk the vinegar with 2 tablespoons garlic mayonnaise, the sugar and salt and pepper to taste. Pour this over the coleslaw and stir well. Keep the remaining mayonnaise in the fridge, either in a jar or covered with cling film. 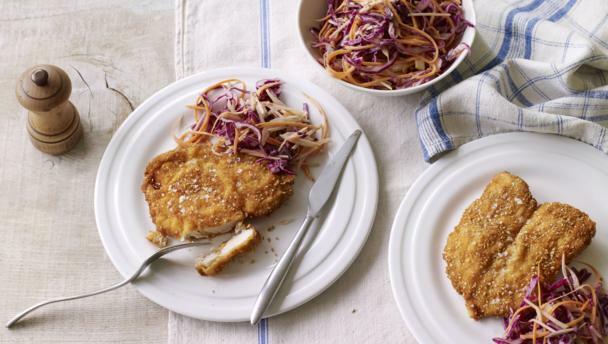 Serve the schnitzel with the coleslaw alongside.